Please choose the products you would like to buy from the list below. Enter the number of products you require in the Quantity Field and Click the Order Button to add the product to your Shopping Trolly. When you have finished shopping click the My Order link to proceed to the ordering area and finalise your purchase. 1.NORTEL MINOR BURNER TORCH KIT...... 2.HOT HEAD WITH HOSE & DESK BRACKET...... 3.The ECONOMY HOT HEAD KIT...... 4.UPGRADED HOT HEAD KIT...... 5.COMPLETE HOT HEAD KIT...... 6.BETHLEHEM ALPHA TORCH...... 7.BETHLEHEM BRAVO TORCH...... 8.BETHLEHEM CHAMPION TORCH...... 9.NORTEL MEGA MINOR TORCH...... 10.BETHLEHEM STACKS TORCH...... 11.BETHLEHEM SHARP FLAME HAND TORCH...... 12.NORTEL MINOR BURNER. NOW IN STOCK... DON'T WAIT FOR IT TO BE IMPORTED!..... Didydidium Glasses are listed separately, please see under 'Eyewear' if you need to order them. 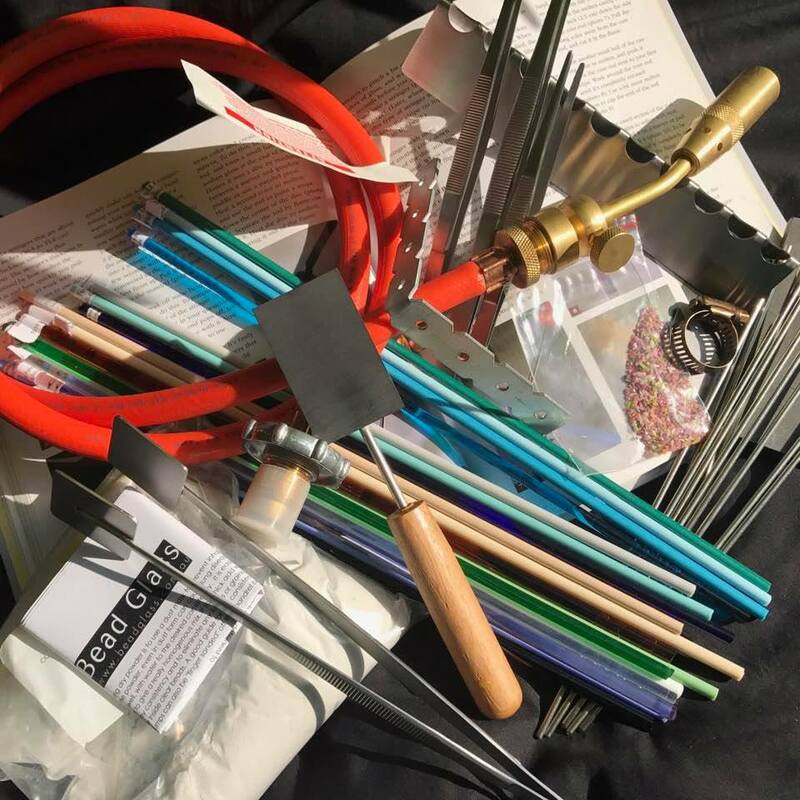 KIT CONTAINS:24 Assorted Moretti Glass Rods,Bead Release, 12x 1.6mm Mandrels,6 x 2.3 mm Mandrels, Tweezer Masher,Graphite Paddle,Large size Graphite Desk Pad,Rod Rest,Set of sturdy lampwork tweezers, Three issues of Spotlight by Corina, on various glass beadmaking tutorials. The Nortel Minor Burner with Stand. 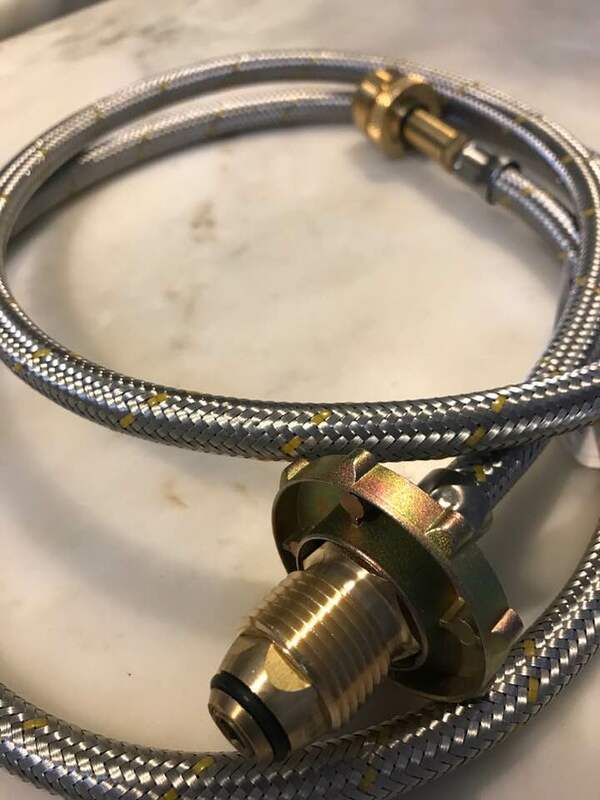 Optional is the Double Hose set (OXYGEN & PROPANE) If you require the HOSES to be fitted for you, please order the TWIN HOSES from the list at the bottom of this page, and they will be supplied and fitted for a small fee of $25 . 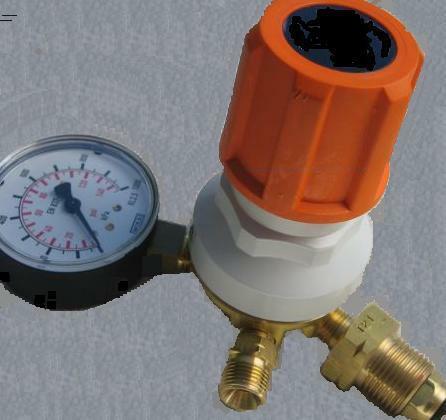 Hose REGULATORS for Oxygen and Propane are also required and can be ordered here on the site... see below. If using this torch with an OXYGEN CONCENTRATOR, which is also available in stock at Beadglass, you will only need ONE REGULATOR ie for the Propane tank. Here is the link to see the flame adjustments you can make on a Nortel Minor Burner: https://www.youtube.com/watch?v=iqCPyAi68mE#t=17 Email for an questions concerning setup. In stock IMMEDIATE DELIVERY! : For use with Minor Burner, Mega Minor Burner and All Bethlehem Torches. Australian compliant regulator displays psi and volume contents of the cylinder. In stock IMMEDIATE DELIVERY, DON'T WAIT FOR IMPORTS!See the video of the Alpha Torch in use : https://www.youtube.com/watch?v=z8nvYG_RQFk Please note we can link up this torch to the HOSES PACKAGE AND FITTINGS CONNECTED TO THE ALPHA TORCH (these can be ordered separately...see below) which will then be connected to Australian gas fittings. All the work done for you! A small $45 fee is added to the final total for the assemblage. This is the new low-pressure, conservative on tanked oxygen,made of stainless steel, Alpha Glass Working Torch. The Alpha is an excellent entry level burner, and perfect lampwork torch. The Alpha delivers more flow at a low gas pressure producing the ideal glass working flame. Depending on what you are doing the flame on the Alpha is highly adjustable….from a crazy huge size to a teeny tiny size. The rewards of using the Alpha are many, equipped with a brilliant reducing flame for glasses such as Double Helix. Turning down the oxygen rather than the gas presents the perfect reducing flame. This torch also has the capacity for a hot focused flame, ensuring easier striking success as well.The Alpha will melt both soft and borosilicate glass with ease. 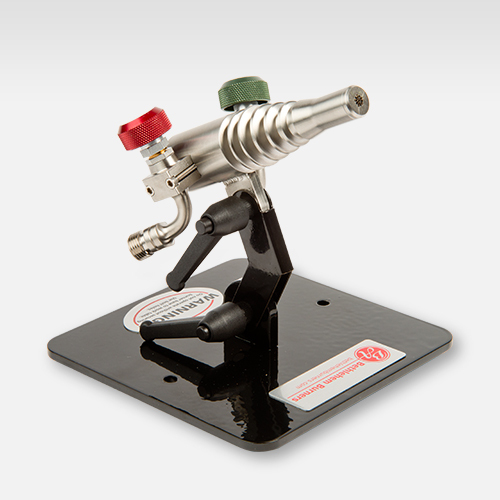 The torch can also be used at the traditional flame settings of 5 psi gas and 20 psi oxygen. It works equally well with propane and natural gas. The Alpha Torch Special Features include: All stainless steel construction that stays cool while the flame is super hot. A unique design that allows for a higher volume of fuel at a lower inlet pressure-7 cu. ft./hr. at only 2 psi. Ideal to operate on gas (1/4 psi) and oxygen concentrator (7 psi)....ie Oxy Con 8L or 10L capacity! 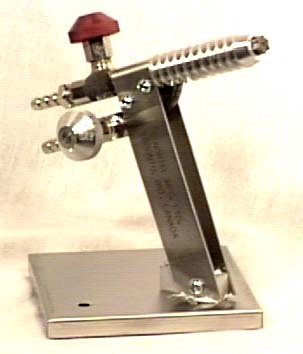 Burner configuration: Center Fire - 6 jets, Pentagon shape face, Diameter 5/8". Suggested glass size: up to a 5/8" / 16mm rod and up to a 19mm Tube. 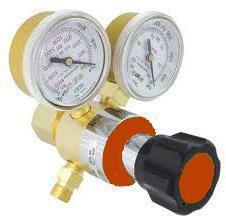 REGULATORS for Oxygen and Propane are also required and can be ordered here on the site. If using this torch with an OXYGEN CONCENTRATOR ,which is also available in stock at Beadglass, you will only need ONE REGULATOR ie for the Propane tank. Sold out. These items are for attachment to the Alpha Torch if required:A Set of 3 m Hoses and Sets of Brass fittings to regulators and torch. In stock IMMEDIATE DELIVERY, DON'T WAIT FOR IMPORTS! See the video of the Bravo Torch in use! https://www.youtube.com/watch?v=4n74M_PJp-Y Please note we can link up this torch to the HOSES PACKAGE AND FITTINGS CONNECTED TO THE BRAVO TORCH (these can be ordered separately...see below) which will then be connected to Australian gas fittings. All the work done for you! A small $55 fee is added to the final total for the assemblage. The Bethlehem Bravo Torch is made with the precision and quality of all Bethlehem burners. A surface mix, low-pressure, made of all new stainless steel and designed specifically with the needs of the artistic flameworker in mind. A dual-purpose torch, it will work easily with both soft and borosilicate glass and is a whisper soft quiet flame. By varying the atmosphere of the flame, you can use the Bravo torch for both shading and highlighting. The razor-sharp center combination is excellent for creating small details. Ideal for production of marbles, sculpting, and vessels, this sleek new torch is both cost-effective and fuel-efficient. Bethlehem's Bravo is one of the most popular new torches on the market today. The Bravo Bench Burner Special Features include: An improved design with all stainless steel construction that stays cool while the flame is super hot. A unique design that allows for a higher volume of fuel at a lower inlet pressure- 15 cu. ft./hr. at only 2 psi. Can also operate on gas (1/4 psi) and oxygen concentrators (7 psi)...ie Oxycon either 8L or 10L capacity!. Includes B size fittings for both Oxy and Fuel connections. Purchase a 4 Inlet to 2 Inlet Adapter if you are not going to use a foot pedal. Specifications: Burner configuration: Center fire - 6 jets, Outer fire - 12 jets, Face dia. - 1" (25.4 mm) Full flame consumption: Gas: 2 psi; 15 cu. ft./hr. (425 l/hr. ); Oxygen: 8 psi; 66 cu. ft./hr. (1867 l/hr.) Works: Rod - 1" (26 mm) Tube - 38 mm Dimensions: 6” long with a 6” base Net Weight:1.6 Kg REGULATORS for Oxygen and Propane are also required and can be ordered here on the site. If using this torch with an OXYGEN CONCENTRATOR ,which is also available in stock at Beadglass, you will only need ONE REGULATOR ie for the Propane tank. Sold out. Pack includes 3 m Hoses for Oxygen and Propane. Extra Low Pressure Hoses attached to Torch,2 Sets of Brass Y-Connectors and 2 Sets of Brass Barbs. These Items can be attached to the BRAVO TORCH if required. Sold out. 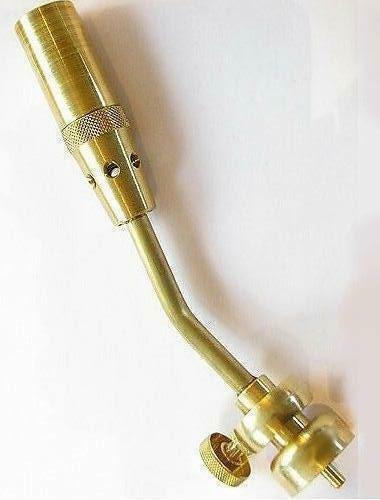 Pack includes 3 m Hoses for Oxygen and Propane, extra Low Pressure Hoses attached to Torch, 2 Sets of Brass Barbs,2 Sets of Brass T-connectors (not Y-connectors) for the Champion.The Y-connectors are designed to aid in a more even fuel distribution when the flame worker goes from running the outer fire to only running the center fire of the torch. These Items can be attached to the CHAMPION TORCH if required. 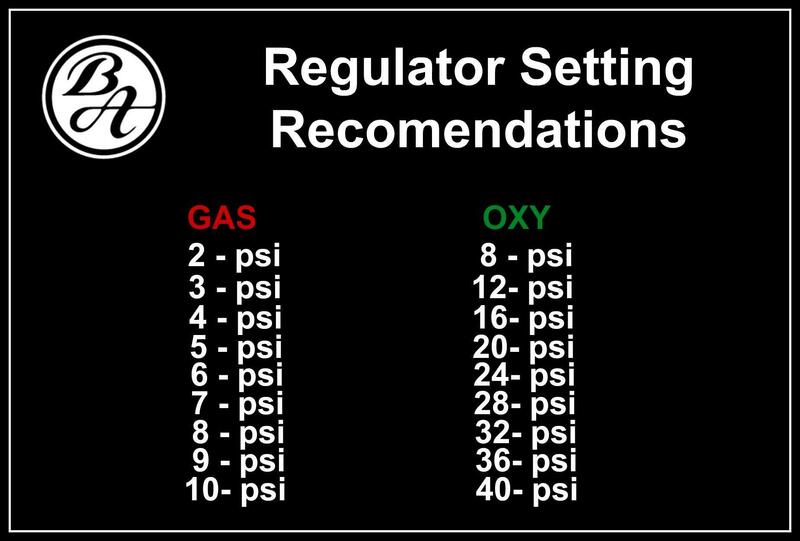 Recommended Pressure Settings for Propane and Oxygen Regulators. Table shows a ratio of 1 part Propane to 4 parts Oxygen for the optimum flame chemistry. NOW IN STOCK...don't wait for imports. 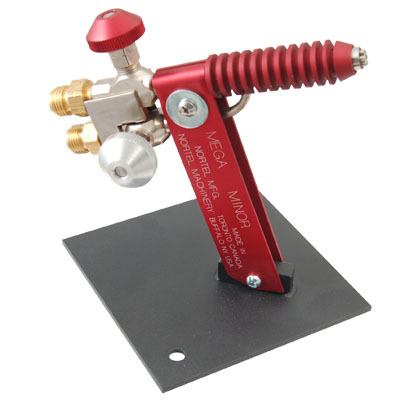 The Mega Minor Burner: A torch that makes more efficient use of oxygen,creating a hotter flame with the same resources. Specs. : Surface mix, 7 port. Natural Gas and Oxygen or Propane and Oxygen (bottled or concentrator). Flame adjustments facilitate 'reduction' and 'oxidized' flame chemistry. Also required are both Oxygen and Propane HOSES, and can be ordered here on the site ...see below. REGULATORS, as well, both for Oxygen and Propane, are also required and can be ordered here on the site. Hoses can be supplied fitted and fitted to the torch, for small fee of $25 . ...in other words, all the hard work already done! If using this torch with an OXYGEN CONCENTRATOR ,which is also available in stock at Beadglass, you will only need ONE REGULATOR ie for the Propane tank. Cleaning & Maintenance. Cleaning the tubes with a fine needle tool (included with the torch) is all that is required. Use: For lampworking beads, small sculpture, marbles, from small up to 3 inches. Primarily for use with soft glass and some borosilicate. Runs well on a single concentrator. In stock IMMEDIATE DELIVERY! :Cost includes all end fittings for hoses, supplied and fitted to the Minor Burner or Mega Minor. These twin 3 m long Oxygen and Propane Hose Sets are for use with the Minor Burner and the new Mega Minor Torches. The Hose for the Propane is Australian grade industry standard.The brass end of the hoses are attached to the gas regulators. 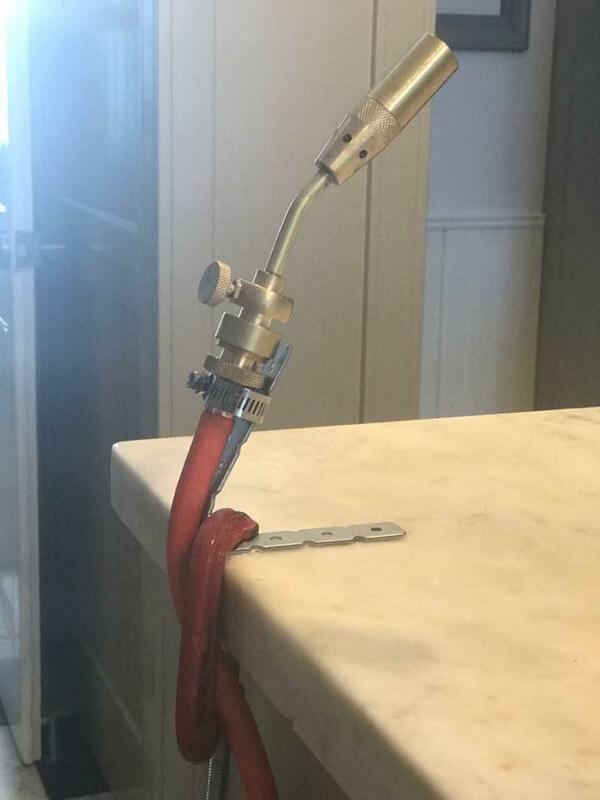 If the Hoses are ordered with the Minor Burner they can be fitted onto the Torch ...in other words, all the hard work is already done for you. Use these hoses when you use a Surface Mix torch (oxygen and propane), meaning the propane and oxygen are mixed at the surface and NOT inside the torch. 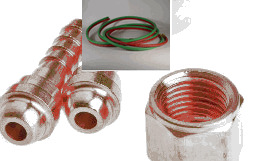 Propane hose fittings are left handed threads and colored red and oxygen are right handed and colored blue, thereby preventing a mix-up when attaching hoses. Email for an questions concerning setup. Don't wait for imports...in stock now. The Stacks bench burner was designed specifically to fill the gap between the Alpha burner and the Bravo burner. This is a torch created the perfect in-between torch for both the beginner and the experienced flame worker. 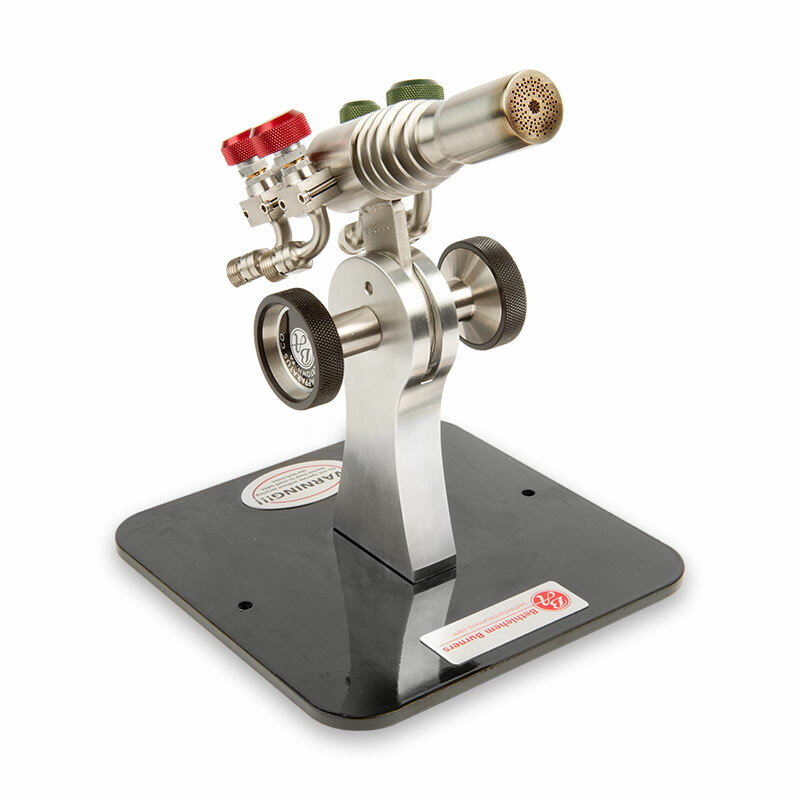 Not only will The Stacks bench burner provide glass artists with a wide range of fuel mixtures, flame temperatures, and flame sizes, but it also provides them with purchasing options never before offered by Bethlehem Burners. 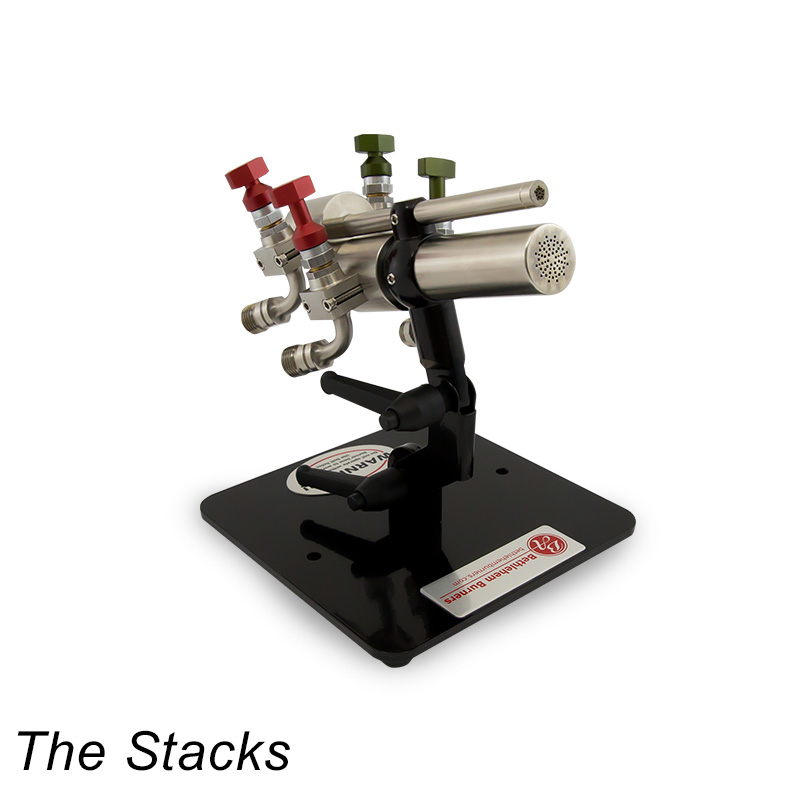 The Top Mount and Bottom Mount can be purchased separately, thus giving flame workers the option to purchase The Stacks in stages. Please note we can link up this torch to the HOSES PACKAGE AND FITTINGS CONNECTED TO THE STACKS TORCH (these can be ordered separately...see below) which will then be connected to Australian gas fittings. All the work done for you! A small $55 fee is added to the final total for the assemblage. A two Set of 3 m pack of Hoses and Set of Brass Barbs. These items are for attachment to the Stacks Torch if required:Set of 3 m Hoses and Sets of Brass fittings to regulators and torch. A Set of 3 m Hoses and Set of Brass Barbs These items are for attachment to the Alpha Torch if required:A Set of 3 m Hoses and Sets of Brass fittings to regulators and torch. NOW IN STOCK.... DON'T WAIT FOR IMPORTS! 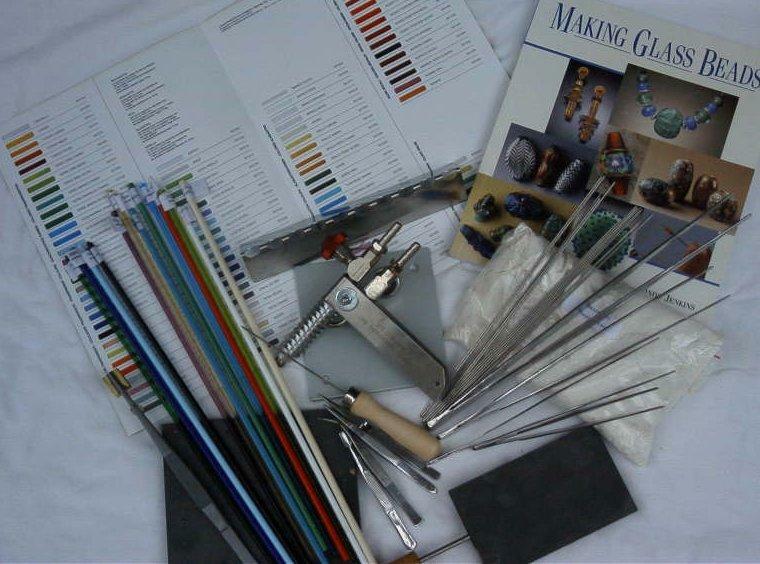 :This torch is the tried and tested MINOR BENCH BURNER preferred by most lampworkers as the 1st step into lampworking, and by teachers and professionals. By far best value on the market. FASTER and QUIETER than a hothead,using 2 gases(Oxygen&Propane) making flame HOTTER and ADJUSTABLE, easy to use for more detailed work. 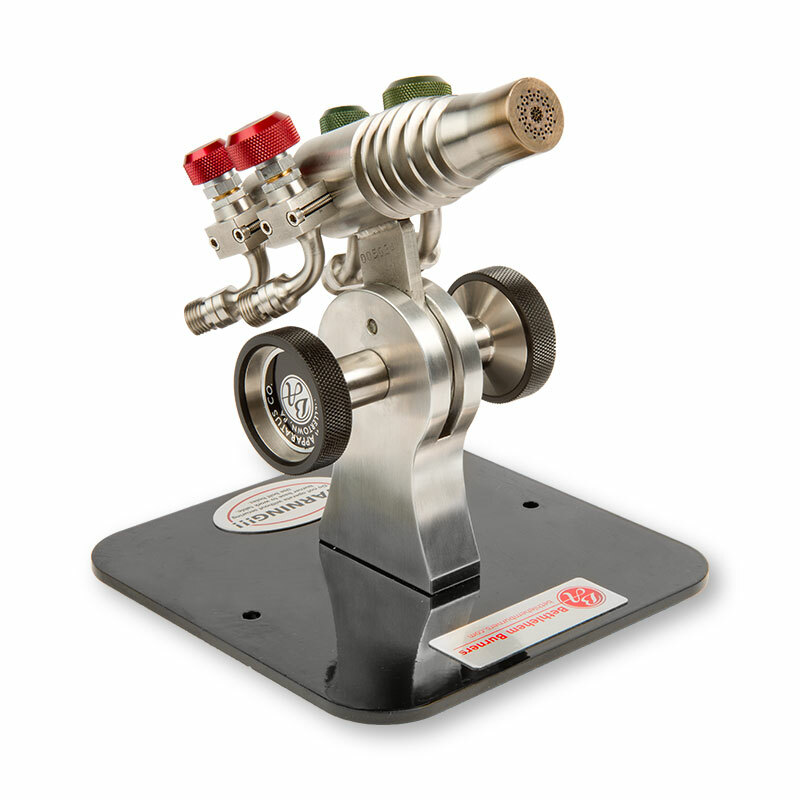 Because the flame size is adjustable it can be dialled from a pointed smaller flame to a larger bushy flame, giving greater flexibility if needed instantaneously...also enables 'reduction' and 'oxidized' flame chemistry. Also needed are both Oxygen and Propane HOSES, and can be ordered here on the site and they will be supplied and fitted for a small fee of $25 . ...see the listing of hoses immediately below. REGULATORS, as well, both for Oxygen and Propane, are also required and can be ordered here on the site... see below. Hoses can be supplied fitted to the torch ...in other words, all the hard work already done! If using this torch with an OXYGEN CONCENTRATOR ,which is also available in stock at Beadglass, you will only need ONE REGULATOR ie for the Propane tank. Here is the link to see the flame adjustments you can make on a Nortel Minor Burner: https://www.youtube.com/watch?v=iqCPyAi68mE#t=17 Email for an questions concerning setup.